The science mission began roughly 90 days after the spacecraft was captured into orbit about Mars. The primary science phase lasted for 917 Earth days. The science orbit inclination is 93.1 degrees, which results in a nearly Sun-synchronous orbit. The orbit period is just under two hours. Successive ground tracks are separated in longitude by approximately 29.5 degrees and the entire ground track nearly repeats every two sols, or martian days. During the science phase and extended mission, the thermal emission imaging system takes multi-spectral thermal-infrared images to make global maps of the minerals on the martian surface, and also acquires visible images with a resolution of about 18 meters (59 feet). 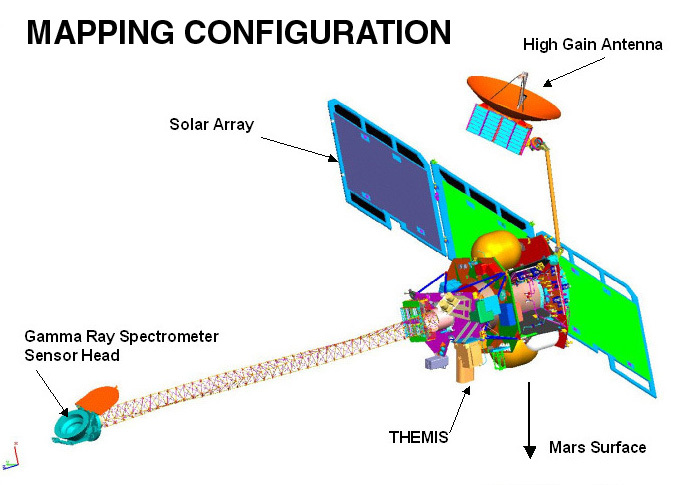 The gamma ray spectrometer takes global measurements during all martian seasons. The Mars Radiation Environment Experiment collected data on the planet's radiation environment.